The Batavia Access Toy Drive is collecting toys for Batavia children in financial need so that they are able to receive gifts this holiday season. The drive ends on Dec. 6 at the high school but the toys will go out for distribution on Dec. 9. The goal is 600 toys, one for each needy child in Batavia. “As of right now we have 87 toys. 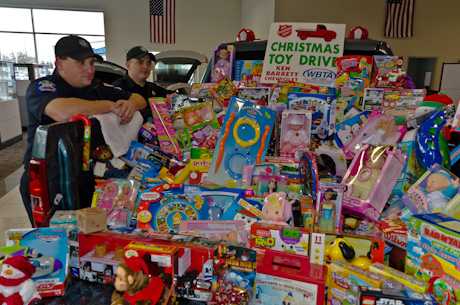 Last year we finished with over 600…the year before 500,” said Matt Holm a social studies teacher at BHS who has been involved with the toy drive for about eight years. Toys are being accepted at the Batavia Public Library, BHS, the police department, and both fire stations. Those interested in participating can also drop them off at locations such as Karl’s Auto Repair and Funway Entertainment Center. The toys are given to low-income families, families that do not have the ability to buy gifts for their children and do not make more than $40-50,000 yearly. Alleviating stress for the parents. The toy drive has been going on since 1948 and was started by a mom of a Batavia family almost 50 years ago. Batavia High School has been involved in the toy drive for about eight years after a flood damaged the toys and they were not expected to reach their goal. BHS is even offering to remove a 30-minute detention for those who turn in a gently used toy to student services or room C112. Students have donated dolls, games, puzzles, and even bikes!